Oh Blush dip powder nails is very simple to apply. Oh blush dip powder kit is composed of 4 products defined by a color code. Before you start, be sure to clean your hands and those of the client. Push the cuticles and remove the shine from the nail with a yellow block. Remove dust. Apply 2 coats of PREP on the nails. Apply BASE & TOP on the nails. Making sure not to touch the skin. Wipe the brush. Press the entire nail into the powder and shake to remove the excess. Clear the grooves. Redo steps 2 and 3. Apply BASE & TOP on the nails.Wipe the brush. Protect by applying the SEALANT and let dry. File your nails and imperfections, if necessary, to get a smooth surface. Remove dust. Apply a coat of SEALANT. Finish with 2 coats of BASE & TOP et let dry. 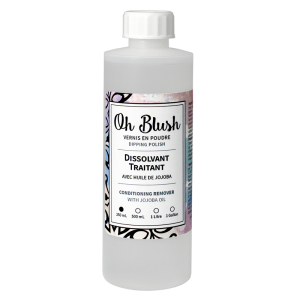 Oh blush dip powder removing ? Soak your nails into the Oh Blush REMOVER TREATMENT Oh Blush for 5 minutes. Redo steps 1 and 2 sereval times until all traces of dip powder disappear. Remove trick : You can also use aluminum foil soaked of Oh Blush REMOVER TREATMENT instead of soaking your nails.